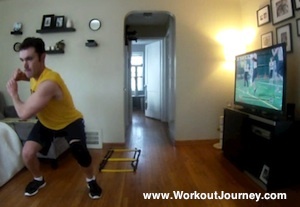 First time doing the Day 11 Game Day workout and it did not go so well. A couple things I struggled with were not knowing most of the moves and this one needed a lot more space then the other Asylum workouts. Kept having to move the agility ladder around to make room for the long jumps or just to get it out of the way. Became kind of annoying about half way through. The moves were very tough. Each time there was a second round of it I had to modify them because my energy was low and I was out of breath. Shaun T definitely has some creativity when he comes to his moves though. The surfer move was different along with the jumping baseball swing at the end. I never would of thought of those. Very much enjoyed this workout and am looking forward to the next time I do it. Gonna have to do it outside the next time so my small house does not limit me from doing the workouts.